Arizona Valerian is a member of the Valerian Family. It grows to 14 inches in height and has elliptical dark green leaves which grow in pairs from a central leaf stem, except at the end of the stem where a single leaf lobe appears. The plant grows in moist coniferous forests at elevations between 4500-8000 feet. 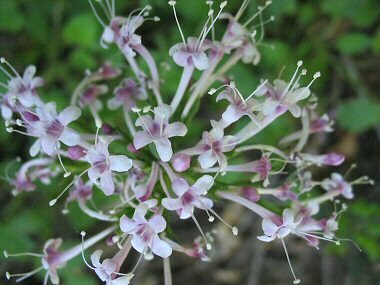 Arizona Valerian give off an unpleasant odor when dried. Arizona Valerian typically blooms between April - July and produces a 2 inch wide cluster of small lavender flowers with 5 petals. The flowers are about 1 inch in length, including the stamens which stick out from the end of the flower.